Thanks so much to @tweetwoofmeow for the translation! Scans can be found HERE. This is a translation, not something that I wrote. American actress of Serbian descent in exclusive interview for the Story, speaks about her everyday life in America, about what did she learned growing up in a large family, reveals when did she cried the last time and what can always give her an adrenaline rush. Magazine Story had a privilege to speak with a girl who our medias describe like a Serb who seduced Hollywood. Actress Stana Katic (36) is the star of the popular ABC’s TV show Castle, which airs on FOX TV Serbia, and that arrangement gave her a chance to appear in some of the most watched American talk shows, where she proudly spoke about her roots from this part of the world. 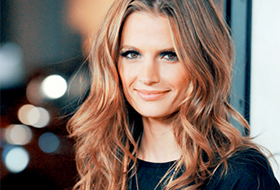 She comes from the family of Petar and Rada Katic, Serbs from Croatia, who emigrated from ex Yugoslavia to America. Today she lives under the hill with Hollywood sign on it and proudly treads the red carpets of some prestigious premieres. With a charm and modest lady we met in Athens, where she promoted the beginning of the Castle’s seventh season in Europe. That was an opportunity to embark on the adventure of sketching a portrait of this artist, in the atmosphere where a few agents are taking a really good care for her. Is this your first time in Greece and what usually makes you to visit the old continent? When you say “a job” on what specifically do you think? The sixth season ended up on a way that your fans and the fans of the action can’t wait to see what’s going to happen next. Can you reveal us something about the season seven? 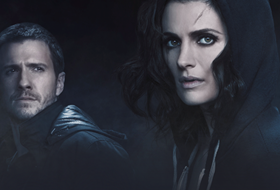 In Castle you play a role of a detective. So, in your private life do you love to explore and what can always give you an adrenaline rush? Have you ever asked your parents about your name? How is that to name their daughter Stana? You have four brothers and a sister. Growing up in a big family, did that make you stronger or you were spoiled, a brat? In American medias you talked a few times that you are proud of your roots and that you can’t wait to speak Serbian. In what situations you speak our language? Life in Hollywood, is it really as glamorous as it looks like? From your biography we can see that you are really dedicated to your career. You finished one prestigious acting school in Chicago and you are constantly in a mood to learn something new. Do you believe in knowledge or fate? Sport was a part of your life. You’ve trained karate. Is that responsible for your nice figure? Do you love fashion and how much you pay attention on your look when you are at the other side of a camera? When have you cried last time and why? With intention to meet you better, can you tell us what’s your favorite food and color? At the end, I’m sorry to be a little bit cliche but do you have a message for your fans in Serbia?